D Zone had already obtained great response from the initial billboard and banner campaign they launched for CSUN’s extension program. D Zone wanted to maintain the momentum of the initial launch, while also taking the messaging further. I was asked to concept new banners and billboards for the second phase. 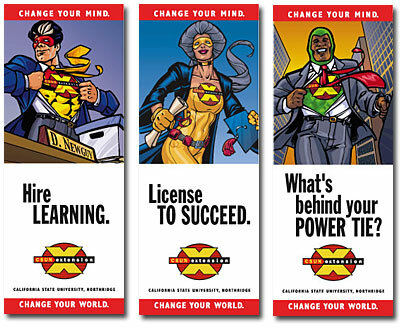 We extended the original campaign’s super-hero theme, using the visuals to communicate a message of transformation. The billboard and banners had all the impact of the first campaign, while also taking the message to the next level. The campaign earned a 2001 Gold Award from the University Continuing Education Association.